Kyo-o-gokoku-ji was one of the state-sponsored temples constructed for protecting the nation during the establishment of the Heian-kyo. In 823, the emperor conferred the abbotship of the temple on the great Buddhist teacher Kukai, who made it a seminary for the practice of Shingon sect (esoteric Buddhism), as aresult of which the temple compound took on a genuinely monastic appearance. Destroyed by fire several times during civil wars, the goverment rebuilt this temple on each occasion. The temple buildings comprise the Minami Daimon (south gate), the Kondo (main hall), the Kodo (lecture hall), the Jikido (refectory) and the Kita Daimon (north gate), laid out along a north-south axis, with the Gojunoto (five-storied pagoda) to the southest and the Kanjoin (Kanjo ceremony hall) to the southwest. As this configuration reflects the original layout of the temple, it is significant as a standard for Heian-kyo restorations. The Kondo, rebuilt in 1603, displays a magnificence and majesty characterristic of the Momoyama Period architecture. 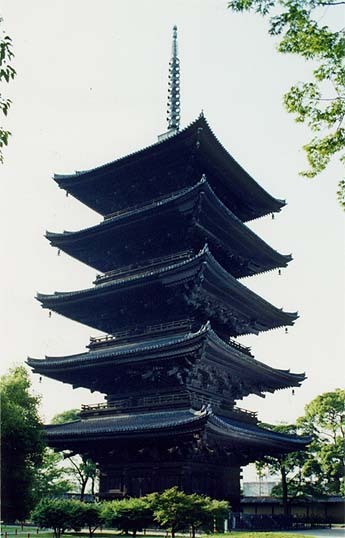 The five-storied pagoda was reconstructed with a reprospective appearance in 1644. As the tallest of all extant pagodas, it is a landmark of Kyoto. 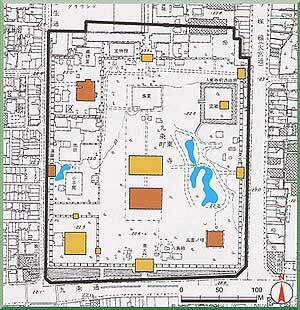 The Daishido, built as a residence for Kukai, was destroyed by fire in 1379 and rebuilt in the following year. While the Raido (hall of worship) which enshrines a statue of Kukai, and its lobby were added in 1390, the Daichido has an elegant appearance of the shinden-zukuri.